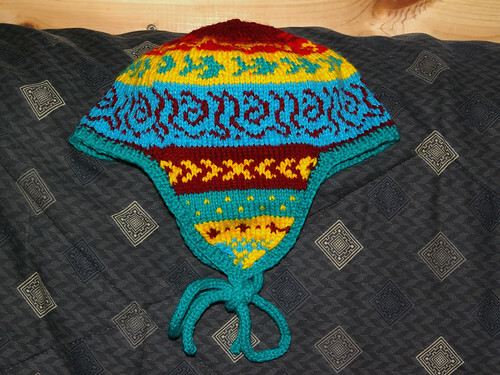 I made this hat last year using worsted weight ysize 7 or 8 needles, because I thought the sport seemed too small for my grandson. I was wrong, but when my 16 yr. old daughter saw it, she grabbed it and said “this is mine!” She is a 95 lb powerlifter, and has worn or taken this hat to every meet for luck (usually takes 1st place). Now all her friends want one, and it has been renamed the “beast hat,” because my daughter is known as the mini-beast, She has a 220 lb. deadlift.) She has finally agreed to give the original to a guy friend, if I make her another one in her theme colors before her next meet. The original was made out of tiny bits of leftover yarn, and the layout wasn’t even planned. I kinda thought it was a little ugly, but those high school kids think it’s the greatest. So…. thanks for a terrific pattern! One tip for new knitters, because I am, and had a devil of a time getting started on dpn’s. Didn’t know I could slide the stitches to the other end of the same needle, as in an I-cord for a few rows. Just figured it out after making my first i-cord a few weeks ago. hola, no inventes ese gorro esta padrisimoo, te luciste felicidades!!! Estoy haciendo un gorro con orejeras, pero con ganchillo, tengo que prepararme mentalmente para aventurarme a hacerlo con agujas y para más, con tantos colores. Lindo chullo! no veía uno desde que fui a Perú, donde creo que es un gorro tipico…ya recordé porqué queria tanto uno, está genial! y gracias por el patron…intentaré hacer uno. que hermoso gorro! Me encanta. Cuando aprenderai fair isle o tejar con dos colores, seguramente hacer por mi hijo! Wow, what a gorgeous hat — and I love the scarf above too. I am so impressed that you designed it yourself. I’ll be back to be further motivated by your site again. Thanks so much for sharing! Love the toddler hat. Do you have the same hat in teen’s size. I have not been able to find one that I like as well as your toddler hat. te pasaste, lindo el gorrito, contaras como lo hiciste, tefelicito, hermoso. Hola Jigra o Carlos… está maravillosos ese chulo… muy lindos colores. Te felicito haces cosas maravillosas. me encanto el gorrito con oregeras,, la forma y el diseño guuuuuaw…. Hi Charles! the hat is lovely! I’m sure your friend’s little one will look adorable wearing the jacket and the hat.